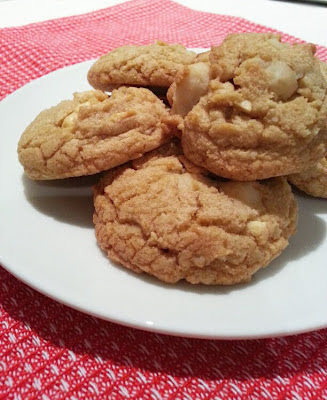 Anyways, White Chocolate & Macadamia Nut Cookies are one of my favourite cookies to eat! It's chewy, and has the right amount of sweetness to it. Hmm..though it's usually sweeter than Chocolate Chip cookies. Who doesn't like to treat themselves once a while? Yum! So here you are, with this yummylicious cookie recipe! Adapted from "For the Love of Cooking"
2. Combine the flour, baking soda and salt in a small bowl then set aside. 3. Beat together the melted butter, brown sugar, white sugar, egg, egg yolk and vanilla with a mixer until creamy. 4. Gradually add the flour mixture to the sugar mixture until just mixed. 5. 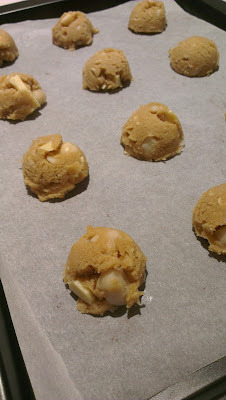 Stir in the macadamia nuts and white chocolate chips by hand. 6. Use a mini mechanical ice-cream scoop to drop cookies onto the lined baking sheet. 7. Bake for 12-15 minutes or until the edges look golden brown. The back of the cookie will feel soft to touch. 8. Cool on the baking sheet for at least 4-5 minutes so the cookies can set before moving to a rack.